Krakow went to the dogs in the best possible way this weekend, as an army of dachshunds descended on the city centre. The dogs – and their owners – were marched from the Barbakan, along Floriańska to the Market Square at noon on Sunday. The march was led by a brass band and flag-bearers. 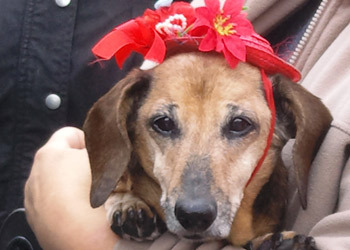 The Dachshund March, or Marsz Jamników, has been held annually in Krakow for the past 15 years. This year’s theme was the Battle of Grunwald, to commemorate the 600th anniversary of the decisive victory. The dogs arrive dressed in various costumes, or au naturelle to show off their sleek forms.